Take a seat and enjoy the talk with Andrew Zimmern, host of the Travel Channel’s popular show Bizarre Foods with Andrew Zimmern. Last month’s Gastromonth in Taipei was a celebration of our fair city’s inclusion in the recent Michelin guide. (Read: 24 Michelin Stars Bestowed to 20 Restaurants in Taiwan) Chefs came from across the globe to be wined and dined (and to wine and dine others). Local Taiwanese chefs demonstrated their kitchen acumen, taking their rightful place in the world’s culinary spotlight. While there were many highlights, for us, perhaps the best part was being asked to share a table with Andrew Zimmern, host of the Travel Channel’s popular show Bizarre Foods with Andrew Zimmern. Taiwan Scene dined with Andrew at Taipei’s Michelin-starred Palais De Chine, conversing on subjects ranging from food, culture, and spirituality to Taipei’s evolving place on the global culinary map. Taiwan Scene: Andrew, on previous visits with your show Bizarre Foods you focused a lot on Taiwan’s more famously challenging fare…stinky tofu, gooseneck, stuff like that. But on this visit, you’re collaborating with the Taiwan Tourism Bureau and your own travel planning company, Journy, to explore Taiwan’s haute cuisine scene. How did this come about? Andrew Zimmern: When it boils down to it, I’m basically a culture geek. When I pitched the idea of Bizarre Foods as “a fat white guy running around the world eating bugs,” I knew it would be an easier sell for American Television. But really, I meant Bizarre as in “unique and interesting.” I wanted to show unique and interesting stories from the fringe because I thought this would promote peace, tolerance, and understanding. I’m a food guy, and I think of food as the best lens through which to interpret a culture. So this trip is still about interpreting culture through food, no changes there. We’re just hitting different places. Taiwan Scene: So in a sense, your current trip reflects the ongoing change in Taipei’s Culinary scene? Andrew Zimmern: Well, my first visit here was 11 years ago, and one of the main things that’s changed dramatically here is how Taipei’s restaurant culture has risen to match its street food culture. Increasingly, people are expecting a higher level of service. When I was planning this trip with Journy, I told them I still wanted to hit the night markets I love, still needed to get my soup dumplings at Din Tai Fung, still wanted to have my ice deserts. But alongside these, I’m also visiting some of Taipei’s upper-end restaurants, like Long Tail, where I ate last night, and Palais De Chine, where we are now. But this all fits under the same big umbrella. Taiwan Scene: Food as a lens through which to view culture? Andrew Zimmern: Exactly. As I see it, food is like music. There’s pop music, there’s country, there’s punk, there’s classical symphony music. And even within these classifications, there are a myriad of sub-classifications. And I like all of them. So to follow through on that analogy, what’s happening in Taiwan is that the symphony side of thing is really taken off. 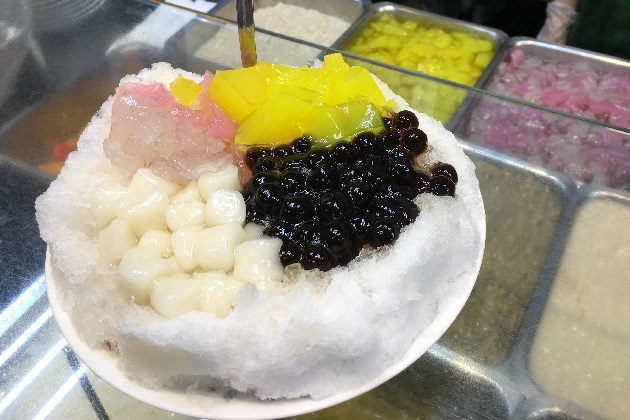 Taiwan Scene: How does Taipei compare to other food cities? Do you consider Taipei a “great” food city, or just a “good” food city? Andrew Zimmern: What makes a good food city a great food city is having breadth and depth. Taipei has always had a great deal of depth, great Asian food and so forth, but now it’s also becoming equally known for its breadth. I mean, I’m choosing purposely not to eat any of the great Italian food being cooked here, and I probably won’t hit any of the other great non-Asian restaurants in town. I’m glad they’re here, but that’s not why I’m here. But the fact that they are gives the city breadth to match its depth, making Taipei a great food city, on par with any other on the planet. Taiwan Scene: What are your plans for this trip? Andrew Zimmern: I basically told my people that I wanted to experience the newest, hottest most trending things going on in Taipei, so they’re curating the trip around that. Things change quickly here. The best oyster omelet three years ago might not be the best oyster omelet today. I need to be with people who can show me what’s cool and what’s great. At the same time, I like to be surprised a little, so I haven’t looked much at my schedule. The one thing I have planned is a trip with a bunch of chefs to a local fish market. It’s in the middle of the night, so I need to psych myself up a bit for it. Taiwan Scene: Are there any foods that you consider must-eat Taiwan dishes? Andrew Zimmern: Oyster omelets. The really good ones are just fantastic. Our mutual friend who writes the blog Hungry Girl in Taipei is going to take me to the best one in Keelung. She’s also going to take me back to my chicken fat rice guy. Another dish I need to have again is that rice sausage thing with sticky rice. There are a bunch of vendors that are “meh,” but then there’s two or three that’s just amazing. Taiwan Scene: I think there’s one in the Keelung night market that’s good. 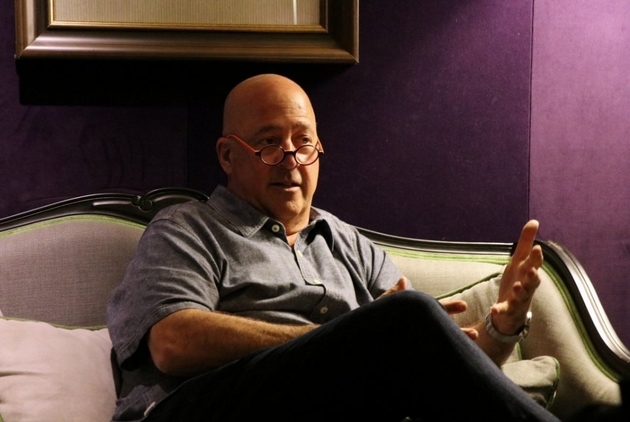 Andrew Zimmern: Yeah, I’m that’s the one I’m going to go to with Hungry Girl in Taipei. Taiwan Scene: How about must-visit Taipei restaurants? 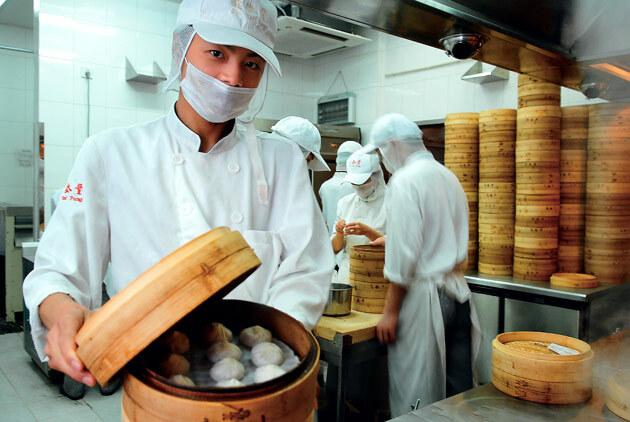 Andrew Zimmern: I wouldn’t dream of coming to Taipei without visiting Din Tai Fung. I’ve been a regular there for a long time, the manager’s my friend, and we’ve made great TV there on three occasions. So I’m going to go there, hang out with Alice and throw down a couple of soup dumplings. Taiwan Scene: Does Taipei’s inclusion in the Michelin guide representing a leveling up of sorts for the city’s food scene? Andrew Zimmern: For sure, but I think Taipei leveled up a long time ago. I mean, Michelin is basically confirming what you and I have known for a long time, namely that there are restaurants in Taipei on par with Michelin-star restaurants in every other city in the world. Taiwan Scene: You’ve been pretty outspoken about the shortcomings of Michelin. Andrew Zimmern: Look, I’m not a Michelin anarchist. But I am a Michelin reformer. I believe in guidebooks, I believe in rating systems of some sort because people need to have a baseline by which to evaluate restaurants. But I was quite vocal about the Euro-centricity of Michelin when they were ignoring cities like Taipei. But this ethnocentrism is starting to break up now. Taiwan Scene: Five, ten years ago, the consensus seemed to be that Taipei was a place you came to for street food, but not for restaurants. Does this seem to be changing? Andrew Zimmern: Well, there’s been a big change in restaurant culture over the last few years, marked by a growing expectation of ambiance and good service, the ability to make a dinner reservation, stuff that makes it easier for travelers to experience Tapei’s restaurant culture. I think this is a really cool thing, sort of the latest growth spurt in Taipei’s overall food culture. Taipei’s street food scene is still great, maybe the best in the world this year. But the idea that it wasn’t possible for the restaurant scene to match up because the culture wasn’t up to it, yeah, that idea is fading away. Taiwan Scene: What are some of the more memorable restaurant experiences you’ve had on this trip? Andrew Zimmern: I really enjoyed yesterday’s visit to Long Tail. There was a big window into the kitchen, and the crew was dressed smartly, moving beautifully and rhythmically. I think it’s important to see the professionalism with which cooks in Taiwan conduct themselves. The meal was superb, and afterward, I took a walk and caught the perfect image, one of those once every trip images that really captures the essence of the trip. Taiwan Scene: What was the image? Andrew Zimmern: A restaurant worker having a break in an alley, squatting in the traditional way that only Asian people seem to be able to do properly, having a smoke while the blue light of the kitchen shone on him. Here was this cook who’d been putting out great food all night, taking a break. I’ve been trying to make Invisible people visible in the food world for 15 years, on TV and in writing, so this image just seemed to encapsulate that. Taiwan Scene: Last question, hypothetical scenario. A friend of yours is coming to Taipei for three days, not to shoot a show, just to eat. They ask you for some Taipei must-eat suggestions. Where do you steer them? Andrew Zimmern: Not hypothetical at all. I get three requests like this a week. I’d definitely send them to Din Tai Fung for soup dumplings. I’d also send them to Shilin Night Market because I think it’s the most navigable night market and its kind of a must-do experience. I think I’d also suggest the Gongguan area. I know it isn’t a tourist night market, more of a student place, but I like hanging out where there are tons of young people. I like the energy. For a general suggestion, I’d tell them to eat plenty of seafood. The seafood in Taipei is underrated. Finally, I’d send them your email so you could steer them towards whatever the hottest new place in town is. Taiwan Scene: Any friend of yours is a friend of ours. Thanks for coming back to Taipei, Andrew!